So, it was inevitable, after going through the entire alphabet in flowers, that they’d all be reunited when all was said and done. 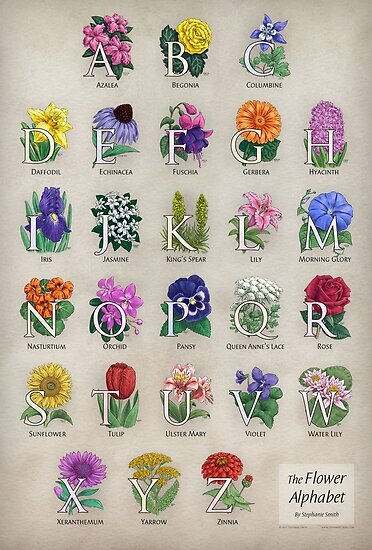 I’m now offering “The Floral Alphabet” as a poster and/or art print in both of my shops: at RedBubble and at Zazzle. What’s the difference between the two sites? Basically, it depends on what kind of options you want, and if you were planning on buying anything else from either site. RedBubble’s printing is very high quality, but Zazzle has many more options to pick from. And both companies are very good about exchanges and returns if you are at all unhappy with the quality of what you receive. I should be adding more gifts and housewares using the Floral Alphabet art to my Zazzle store in the weeks to come, with and without the monograms. If you have any particular requests, please let me know! This entry was posted in alphabet, Critterwings, Finished drawings, flower by stephanie. Bookmark the permalink.